Jonathan Privett, co-owner of Word On The Water inside the barge. I love stories about unusual libraries and unusual bookstores. Here’s one from the New York Times about a bookselling endeavor powered by the famed eccentricity of Englishmen. 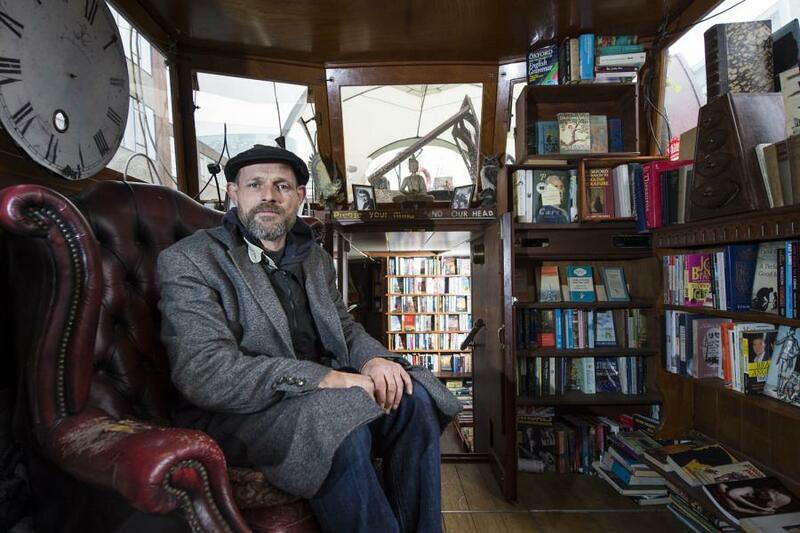 Rod Nordland writes, “The two men who run London’s only floating bookstore, Word on the Water, are living proof that there really is something you can do in life with an English lit degree, other than teach English literature. “The store — a 50-foot-long canalboat stuffed to its bulkheads and overflowing onto the towpath with books — has a permanent berth on the Regent’s Canal, around the corner from the British Library. This comes after years of its owners staying one step ahead of eviction from the canals, by relocating fortnightly. “The men got the idea for the store from a book, of course — ‘Children of Ol’ Man River,’ in which Billy Bryant recounts how his British immigrant family arrived on the Mississippi River, homeless, living on a floating board, which they built into a theater, and then into the showboat craze of the late 1800s. “Mr. Privett had the book-business experience. Before settling on his canalboat, he had at times been a homeless squatter who supported himself selling used books from street stalls. “A French friend, Stephane Chaudat, provided a boat big enough to be a store, a 1920s-era Dutch barge; he remains their partner. “Then it did. A friend used the sea toilet on the book barge and left an inlet open, and the boat sank to the bottom; even their prized copy of ‘Ol’ Man River’ was lost. Shortly later, the boat Mr. Privett lived on sunk as well, and he lost all of his family photographs. Read the whole saga here. Privett and Screech–they sound like a vaudeville act! Talk about marching to the beat of a different drummer–I’m glad they found each other!